The iWork suite under Mac OS X 10.7 includes a rather peculiar default option that backs up every files prior version that you are working on, as a separate file in the same folder. Instead of the backups only being accessible from Versions, this spills out into the Finder, where a file called “Document.pages” will also have a “Backup of Document.pages” file stored in the same directory. This quickly turns into a giant cluttered mess for students or anyone else who works with a lot of Pages files, since essentially a duplicate of each one is stored in the same folder. This will stop storing the backup files in the Finder, but unfortunately this also seems to disable the Versions feature for the app too, so keep that in mind before you turn this off and get used to hitting Command+S often again. Automatic backups and versioning are undoubtedly a useful feature, but this is rather bizarre and fairly un-Applelike to clutter folders with excess files, so maybe it’s just an oversight or a bug. I’m not sure what tweaks you have enabled, but this is definitely not a default option. I’ve been using Pages in Lion for weeks and have no such duplicate files; my Versions works correctly as well. 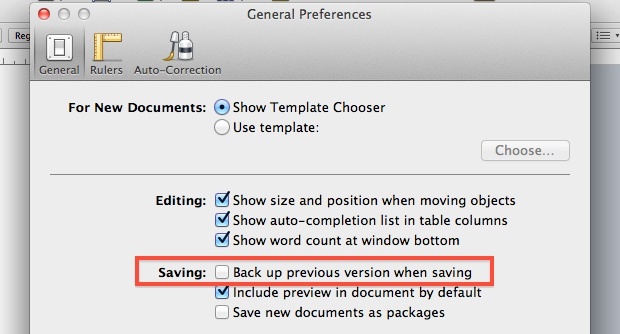 You can achieve the same result by enabling “Save new documents as packages”: this will includes older versions of a file inside the file itself, but requires every file to be saved again like it was new. I agree that it’s annoying. But I think it would be great if I could configure it (as I do BBedit) to backup a new date-stamped file every time I save the original – to a location I define! Paul – thanks. This just starting happening weeks after upgrading ios. Was getting ridiculous. Appreciate the learning. I’m having the same Backup problem with all my documents, but most of them are in Word for Mac 2011 and there does not seem to be same option for excluding them in Word Preferences.